The latest Asean summit in Singapore underscored the emergence of China as the new regional leader. The 10 member nations of the Association of Southeast Asian Nations took a tough stance on trade protectionism in the West when they met last week, while extending an olive branch to China over geopolitical disputes. While lingering anxieties towards China’s rise persist, smaller regional states have become increasingly exasperated with America’s assault on the global trading regime. Meanwhile, China is increasingly seen as the new centre of economic gravity. Eager to maintain robust trade and investment ties with Beijing, Asean took a soft approach to the South China Sea rows that have driven a wedge between China and several rival claimants in recent decades. As the most developed nation in Southeast Asia, Singapore has long been a pillar of greater integration in the region. It has been a major investor in the Initiative for Asean Integration, which aims to narrow the institutional and development gaps among member nations through capacity-building projects in various fields. The city state is also home to some prominent diplomats and strategic thinkers, who have been a major force in shaping the discourse over Asean’s future. Crucially, as a highly trade-dependent nation, Singapore has a direct stake in ensuring stability in regional lines of communications, particularly the Strait of Malacca as well as the South China Sea. Yet Singapore isn’t a direct party to any of the major geopolitical flashpoints in the region, whether in the Mekong River or in the South China Sea. As a result, it has always been in a unique and crucial position to steer Asean in the optimal direction as well as mediate regional conflicts. As this year’s chair, Singapore has emphasised the importance of a “rules-based order” in Asia. Although Asean has a consensus-based decision-making process, the chair has the power to shape the regional agenda, identify priorities, and issue, if necessary, unilateral “chairman statements” in the event of disagreement among member nations. Trade and investment are seemingly at the centre of Singapore’s idea of a rules-based regional order. In recent months, Prime Minister Lee Hsien Loong has taken an increasingly vocal stance against threats to free and open trade among nations. And Singapore seems to view China as a key partner in ensuring the survival of economic globalisation. Earlier this month, the Singaporean leader met Chinese President Xi Jinping in Hainan on the sidelines of the Boao Forum, which brought together political and business leaders from around the world. During their meeting, the two leaders reiterated their commitment to maintaining the global free trade regime amid rising protectionism in the West, particularly in America. Lee told the forum in a speech that “economic dynamism” was only possible when nations were “open and connected to one another”. He also welcomed China’s “further steps in financial sector reforms, in opening up foreign investment rules, in protecting intellectual property and increasing automobile imports”. And in a direct rebuff of the move by US President Donald Trump’s administration to impose unilateral tariffs on Asian trading partners, Lee emphasised the centrality of free trade to global peace and stability. The city state’s strong opposition to trade protectionism was clearly reflected in Asean’s joint statement, endorsed by all 10 leaders. The regional body said it was “deeply concerned over the rising tide of protectionism and anti-globalisation sentiments” across the globe. It also reiterated Asean’s “continued support for the multilateral trading system”, while pushing for a “swift conclusion” to the China-led Regional Comprehensive Economic Partnership negotiations on a free-trade agreement involving 16 economies from across the Asia-Pacific. The regional body meanwhile welcomed the “early implementation” of the Asean Hong Kong, China (HKC) free-trade and investment agreements signed in the Philippines in November. Strengthening and preserving existing free-trade deals with key partners such as China was listed as a key priority. But in stark contrast to their tough language on trade, Asean stopped short of criticising or even mentioning China’s massive reclamation activities as well as deployment of military assets to contested land features in the South China Sea. Instead, the regional bloc sounded largely upbeat on the issue, welcoming the recent installation of hotlines between China and Southeast Asian claimant states. 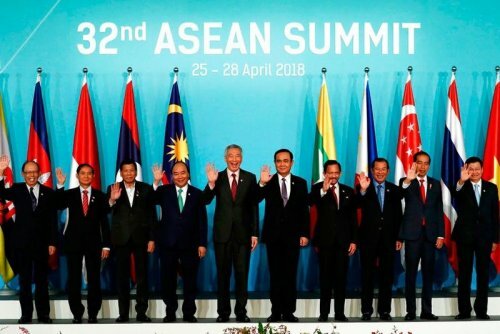 No doubt pleasing to Beijing, Asean also said it was “encouraged by the official commencement of the substantive negotiations” towards the early conclusion of an effective code of conduct for the South China Sea – despite the lack of details on provisions, legalities or a timeline for the final stage of talks. So Asean has chosen to stand up to America over trade and investment issues, but refused to criticise China’s maritime assertiveness in order to maintain strong economic ties with the Asian powerhouse. Trade, rather than geopolitics, has become Asean’s key priority under Singapore’s chairmanship. And this is precisely where China, as the world’s largest trading nation, holds the advantage.